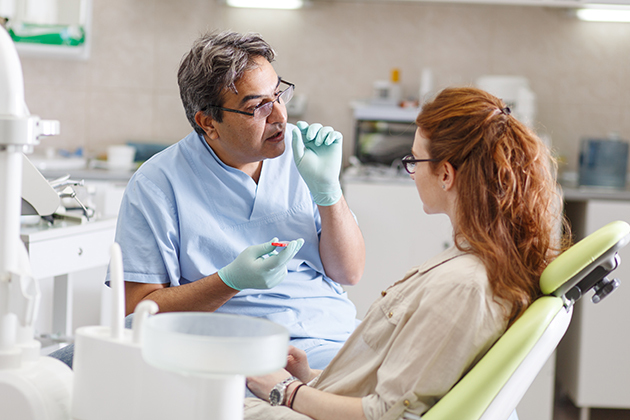 Sure, you can break out the gas or needle to sedate a nervous patient in your chair — but setting a accepting, relaxing and communicative atmosphere in your practice can actually be a better way to calm things down. These simple and research-proven tips can help your patients relax, and see you as an empathetic professional who has their emotional comfort, as well as their physical comfort, as a priority. Researchers at West Virginia University report that a fear of the dentist is really about a fear of pain. As your patients to describe exactly what they are worrying about — is it that their anesthesia won't work? Is it the pain they'll feel post-procedure? Explain all the tools you'll use to minimize their discomfort in detail as much as possible, and as you administer pain reduction, talk them through exactly what they're doing to quell their concerns. Also, work out some shorthand with your patient so he/she can quickly and easily alert you if pain or discomfort should increase for any reason during treatment when speaking isn't an option. Hand signals will work well, and will give the patient a sense of control in case the unexpected happens. Decorate your office like a beach. A study from the U.K. found that many dental patients who utilized guided imagery of the seashore through a headset didn't even pay attention to the procedure as it happened, experiencing less pain and anxiety than patients who didn't experience beach energy. If you can't go the virtual reality route, hanging paintings of seascapes around your office and playing relaxing water and wave soundtracks can have a remarkably absorbing and soothing effect. Don't pay more attention to your computer than your patient's questions. A Brown University study finds that tending to electronic records in front of a patient detracts from the quality of your interaction — and does nothing to quell a patient's apprehension. Make time for notes before or after appointments, or invest in a medical scribe so you can give your full and undivided attention to the person in your chair. That face time is invaluable when it comes to building trust and a positive office experience. Describe what you are about to do. You should also explain why you need to do it in terms of your patient's treatment, and how that procedure is likely to feel to your patient. No doubt you already do some form of explanation depending on the complexity of a specific treatment, but to a very nervous patient, even a cleaning can be made easier if you provide a step-by-step narrative. Try to eliminate any potential surprises. Take a few extra minutes to talk with him/her afterwards. Of course, you want to ask if there are any physical pain issues, but you also want to check in on how they've done emotionally. You can ask, "That wasn't so bad, was it?" You can also inquire about what was difficult for your patient to handle during the procedure. The sound of the drill may have still given him or her a few butterflies, for instance, so reassure your patient that steps can be taken at the next appointment to remedy their discomfort (like turning up the volume on music in headphones). Showing you care before, during and after your patient's treatment in these ways is so easy to do, and will have a significant and positive impact on your patient's experience during their next appointment with you, too.